we had 2 guests over at our place on one sunday evening. i didn’t want to put too much effort in preparation for the dinner, as i had a big sunday brunch with my girlfriends earlier that day. 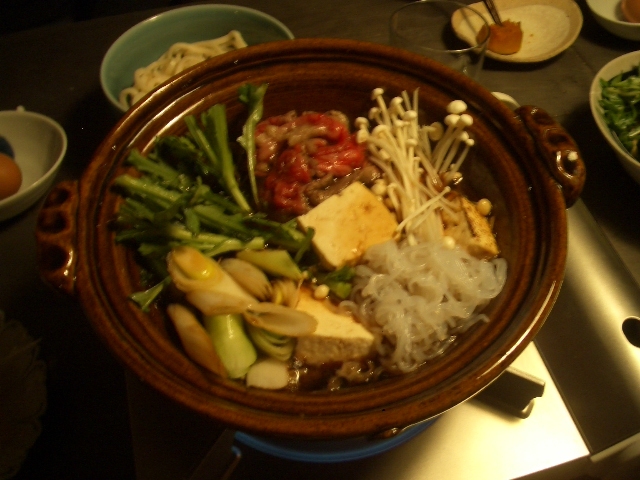 for such occasion, すき焼き (“sukiyaki”) can be a perfect solution. sukiyaki is like a fondu, but we use soy sauce base broth instead of cheese. in theory, you let your guests cook their own food, but it is fun and very interactive. for preparation, all you have to do is to make sukiyaki broth (割り下), cut the vegetables & other ingredients and buy good beef slices. 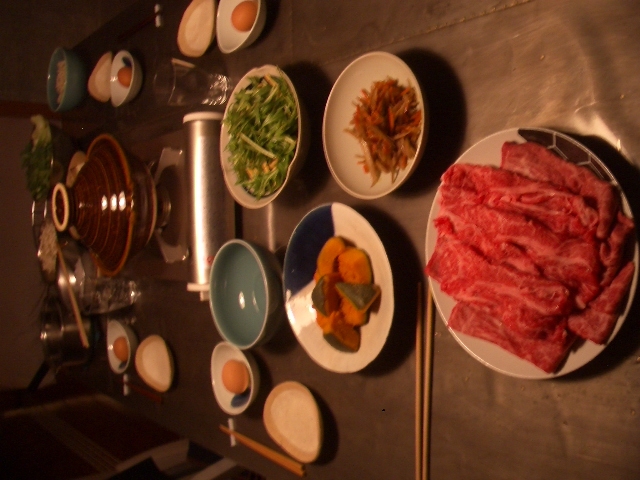 in japan, sukiyaki is regarded as a luxurious meal and is suitable for treating your guests. cooking our own food in the same pot seems to create a certain level of intimacy. it must have something to do with a team work spirit – someone puts the meat in, another puts the vegetables, and another makes sure that the food is not overcooked… and everyone has to keep a good balance of how much you or other people eat from the pot. pour all the liquids in a deep pot, bring the mix to boil, and turn off the heat. put the kelp in and let it cool down. use this broth when cooking the beef slices & other ingredients (japanese leek, japanese shungiku leaves (春菊), shiitake mushrooms, enoki mushrooms, tofu, etc. use fresh raw eggs as dipping sauce (very yummy! ).